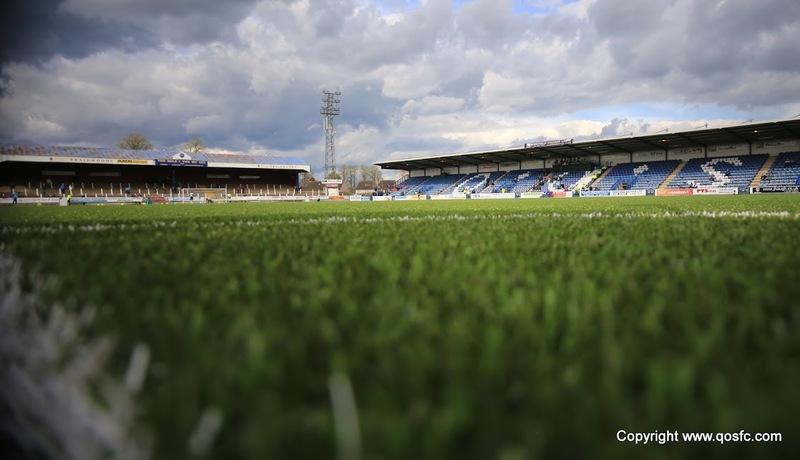 Queen of the South?s unbeaten start to the league season ended after fourteen games as Alloa Athletic ran out 1-0 winners in a tightly contested match at a freezing Recreation Park. The only goal of the game came from the penalty spot on 57 minutes as Ryan McCord slotted home following Ryan McGuffie?s foul. Neither team was able to find the net in open play but did strike the woodwork twice each. Queens got the better of the opening exchanges and were almost gifted the lead on four minutes as Nicky Clark closed down Scott Bain in the Alloa goal and managed to get his boot to the ball but the goalkeeper?s tackle was strong enough to save his blushes. After twenty minutes of the away side pressing Alloa decided to have an attack and Kevin Cawley found his way clear of the Queens defence. The striker sent his finish low past Lee Robinson but could not find the net as the ball smacked off the post and ended up in the arms of a grateful Robinson. Alloa had their tails up and struck the post again minutes later, this time in bizarre fashion. A dangerous attack down the left for Alloa allowed Holmes to cross low to the far post where the ball dropped for Higgins to clear however his clearance smacked off the oncoming Chris Mitchell and looped over a helpless Lee Robinson only to rebound off the top of the post. Just a minute later and it was Queen of the South?s turn to hit the woodwork as Willie Gibson was given too much room on the edge of the box and his fierce effort beat Bain but cannoned back off the crossbar where Nicky Clark was waiting only to be called offside. A midfield clash between Paul Burns and Ryan McCord then left the Queens player down and requiring treatment for a knee injury before the former Dunfermline man was stretchered off to be replaced by Kevin Holt. This stoppage seemed to break the players? rhythm and the game struggled to get back to the tempo of the first half hour but Queens did manage a chance before the half-time whistle. It came from a Chris Mitchell corner which was met by Mark Durnan in the middle of goal. His goalward header was smashed out from under the crossbar by the Alloa defence and the home side held on until the break. The second half continued in the same vein as the first with Queens having marginally the better of the play and the league leaders threatened through McGuffie?s header five minutes in. Mitchell?s delivery was excellent once again and Ryan McGuffie met the ball well but could only send a looping header towards goal that Bain tipped over. Then came the match defining moment as Queen of the South failed to clear an Alloa corner. Ryan McGuffie?s swinging boot caught Martin Grehan and the referee pointed to the spot. It was unfortunate for McGuffie as he was looking to clear the ball but there were no complaints from the away side. Ryan McCord stepped up for Alloa and stroked the ball into the bottom right corner giving Robinson no chance. Immediately after that Queens attack and Nicky Clark found his way clear in the left channel and his cross to the feet of Reilly saw the youngster take a touch before rattling the crossbar from 12 yards. Into the final fifteen minutes and Allan Johnston threw on Kevin Smith and David Hopkirk to try to find a way back into the match but it was the home side who had the better of the chances towards the end as Queens threw players forward. Firstly Ben Gordon headed inches wide from a right-wing corner before an Alloa counter attack saw Kevin Cawley with a wonderful chance to finish the match but he lost his composure and hit his shot well wide. The final whistle signalled the end of Queens thirteen match unbeaten run in the league and saw victors Alloa close the gap at the top of the table to six points. Two defeats in a row for Queens will surely test the character of Allan Johnston?s men after their excellent start to the season. Brechin City are next up at Palmerston on Saturday and Johnston will be keen to get back to winning ways to maintain the Doonhamers? stranglehold on the Second Division title. 19:25 Hi folks and welcome to a very chilly Recreation Park as Queens look to stretch their lead at the top of Division 2. 19:28 And tonight`s whistler is Brian Colvin assisted by flagwavers Graham Chambers and David Dunne. 19:31 Tonight`s match sees the top 2 teams in the division match up and Queens will be looking to make it 3 wins from 3 against Alloa this season. 3 min Both teams have lined up in traditional 4-4-2 formations and Queens have had the better of the opening exchanges. 10 min It`s been pretty scrappy so far but Queens are the only team in it as Alloa haven`t offered anything up front as yet. Strong start. 16 min Off the post! Alloa`s first real attack sees Kevin Cawley sprint clear of the defence but his placed finish strikes the base of the post. 20 min Off the post again! Not sure how that stayed out but Higgins clears it off Mitchell and it loops onto the post before Robinson picks it up. 25 min Queens win a free-kick about 25 yards out and Gibson steps up but it clips the wall and goes for a corner which comes to nothing. 27 min Looks like Paul Burns` game might be over as he receives treatment and the stretcher is out. 29 min Bit of a shake-up for Queens with Holt coming on at left-back and Chris Mitchell moving to centre midfield. 39 min Alloa threaten with Grehan crossing from the left. Holt clears and Reilly nearly gets in at the other end but the defender clears. 45 min Nicky Clark took a whack there and is hobbling pretty badly. He`s trying to run it off though. 45+1 min The game has stretched a bit in the last few minutes with Queens having the better of it but Alloa still looking threatening on the break. 45+2 min Off the line! A Queens corner from the left is headed goalward by Mark Durnan but it`s hacked off the line. Half Time So far it`s 2-1 to Alloa in terms of hitting the woodwork but no goals as yet. Half Time Queens have just about had the better of it in the first half but will need to step it up in the second half if they want to get the win. Half Time The team`s are out and Nicky Clark is on the pitch - looks like he`s recovered from the whack he took. Game on. 50 min Almost. Mitchell whips it in and McGuffie sends a looping header towards goal but the Alloa keeper is there to tip over. 56 min Alloa`s first real attack of the 2nd half sees Nicky Low cut back on his left foot and try to curl it into the far post. Robinson saves. 56 min Penalty to Alloa. 58 min The ball is in the air and McGuffie swipes to clear but the ref says he catches the striker and points to the spot. McCord strokes it in. 62 min Off the bar Reilly! Clark hits the byline and cuts it back to Reilly who takes a touch before smashing it off the bar. So close. 64 min Yellow Card : Chris Mitchell gives away a nothing foul and sees yellow. Must have been something he said because it was barely a foul. 72 min Gibson and Carmichael have swapped wings as Queens try and get back on level terms. Not much happening in that regard at the moment. 74 min Alloa have a chance as they break quickly and substitute Tapping has a shot saved easily by Robinson. 79 min Kevin Smith is on for his first appearance this season as Queens go with three up front. 84 min Great chance Alloa as a corner from the right is headed just wide by Ben Gordon. Very close. 85 min Great chance Alloa as a corner from the right is headed just wide by Ben Gordon. Very close. 87 min Queens are caught with too many forward and Kevin Cawley has a chance to finish it but hits it high and wide. 90 min Queens are struggling to get anything together as Alloa are sitting in and holding onto their lead. 90+1 min Yellow Card : Stephen McKenna stops an Alloa break and is rightly booked. 21:24 First defeat of the season for Queens in what was a very tight affair with the result decided by a penalty. Disappointing.